I have a deep and abiding fondness of exaggerated styles. 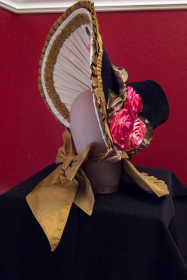 I just finished this bonnet, and frankly, that is amazing. Amazing, because this has been one of my perpetually unfinished projects for YEARS. 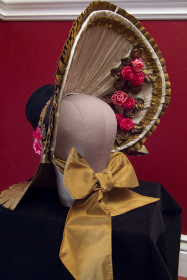 I started this bonnet in April, 2006, at a workshop with Lynne Taylor. She developed the pattern, and even provided the exterior fabric. Over the years I'd work on it in spurts, then get distracted and put it aside. Even my friend Suzette (of Malvena Pearl's Emporium) worked on it at one point, and thanks largely to her contribution I got the gumption to finish the darn thing. A larger photo spread is on my website at this page. Underneath is a wire and buckram frame. The interior is cream silk taffeta. What you're looking at is a buckram and wire frame, covered on the outside with black cotton velvet and on the inside with cream silk taffeta. 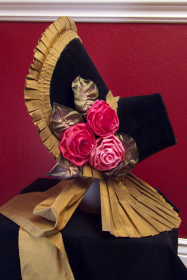 The bavolet, pleated trim, and ties are also silk taffeta, copper cross-woven with olive. 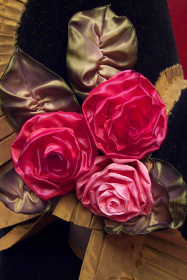 The flowers are made of French ombre wired ribbon. Unfortunately the base is not mulled, so the buckram shows a little through the cream taffeta. 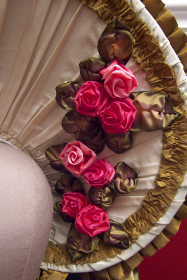 pleated trimmings are silk taffeta. This bonnet demonstrates improvisation to fix, well, things that didn't go right. I cut the velvet for the brim too small, so it couldn't go over the leading edge. To solve that, I cut the cream silk with enough allowance to go over the leading edge. Hiding the cut of edge of that inspired the pleated trim that goes around the edge of the crown. The stitching for the pleated trim goes all the way through to the inside; thus, I added the ruched trim on the inside. I actually stitched the ruched trim (inside) and pleated trim (outside) in one pass, to save some time. I had no idea what else to trim this bonnet with, but a couple of months ago I learned to make ribbon flowers, and inspiration struck when I found some French ombre ribbon on etsy. 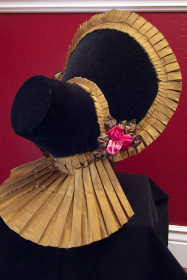 Nevertheless, this bonnet shows how unimaginative my hat trimmings are (compare the hat made for my by Lynn McMasters).